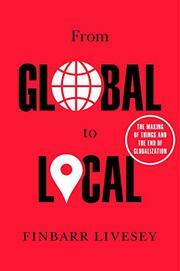 Just as Francis Fukuyama was wrong about history, this book of geopolitical wonkery has it, so all our assumptions about globalization are mistaken—and, perhaps worse, woefully out of date. What if the free trade models that hold that capital, commodities, and labor should move at will from country to country are wrong—if, that is, they proceeded from “an outmoded theory of comparative advantage”? That outmoded theory has, after all, resulted in the flow of manufacturing jobs from Oshkosh to Harbin as well as offshoring, outsourcing, multinationalizing. Livesey (Politics and International Studies/Cambridge Univ. ), who notes that his own family stretches across the world’s time zones, posits that there are any number of good reasons why, in the near future, economic players should question received wisdom and realign accordingly. For one thing, he writes, the near-future economy is likely to be much more highly automated than it is today, meaning that most labor will be done by machines rather than cheap workers in the developing world. The need will be for highly skilled workers to direct and service those machines, and in this regard there is no penalty for manufacturing work to stay close to home. In such a scenario, domestic markets would need to deepen. As the author points out, the in-China market for iPhones is now greater than the market for that commodity in the U.S., so it’s not a stretch to see this happen, even if China “will no longer be able to depend on its role as producer to the world to continue its development.” In a world of 3-D printers and robots, Livesey cautions, international trade will continue but likely with a more regional than truly global emphasis. The argument, accessible and without jargon, is more complex than the simple-minded anti–trade pact economic nationalism that has come to the fore in recent months, but it may still comfort everyone from Occupy Wall Street to the West Wing.